The Reliance CPSE ETF was over-subscribed 4 times on the first day. As per a Business Today report, the anchor investors put in Rs 6,000 versus Rs 1,500 crores reserved for them. For the benefit of our readers, anchor investors are institutional investors who are invited to subscribe to an issue (e.g. IPO), ahead of the public offering. The CPSE ETF offer is attracting a lot of interest because there are several unique features in this offer. Firstly, you should note that offer is not a New Fund Offer (NFO); it is a Further Fund Offer (FFO). The CPSE ETF NFO in March 2014 was a novel concept used by Government of India to divest their stake in select public sector companies through the Exchange Traded Fund (ETF) route. The Government raised Rs 3,000 crores through the CPSE ETF NFO. In the FFO, the Government aims to raise Rs 6,000 crores. ETFs and mutual funds are more retail investor friendly options to invest in diversified portfolio of stocks versus directly buying the stocks in the stock market. ETFs combine the benefits of share trading and mutual fund investments. There are advantages and disadvantages of investing in ETF versus mutual funds. Mutual fund units are priced at the end of the day, whereas ETFs are priced continuously (real time); you can take advantage of intraday fluctuations when buying or selling ETF units. ETFs are more transparent than mutual funds; you can see the composition of an ETF portfolio at any point of time, whereas in case of a mutual fund you will know the portfolio composition only at the end of the month, when the AMCs publish the fact sheets. Unlike mutual funds schemes, ETFs do not have exit loads and therefore, as an investor, you have greater flexibility when you invest in ETFs. Since ETFs are passively managed, their expense ratios are significantly lower than that of mutual funds. By the same reckoning, however, return potential of mutual funds is higher than ETFs. Mutual fund managers aim to beat the market index, whereas ETFs simply track the index. ETFs and mutual funds have advantages and disadvantages vis a vis one another; smart investors, in our experience, have a mix of both in their investment portfolios. You should note that, unlike mutual funds, you need a demat account to invest in ETFs. Another unique feature of the CPSE FFO is the discount. At the time of the NFO the Government gave a 5% discount to ETF subscribers over the market price. In the FFO, subscribers will again get a 5% discount on the market price. Let us understand how this discount will work. For the sake of simplicity, let us assume that the ETF is made up of only 3 PSU stocks, Stock A, B and C.
In other words, if you invest in it you will be able to buy 5% more shares in value terms compared to what you can buy from the market for the same amount of money. When you sell the ETF units you will get the market price. The benefit for CPSE ETF FFO to investors is obvious. The third important feature of the CPSE ETF FFO is that, it qualifies for tax savings benefits under the provisions of Rajiv Gandhi Equity Savings Scheme. 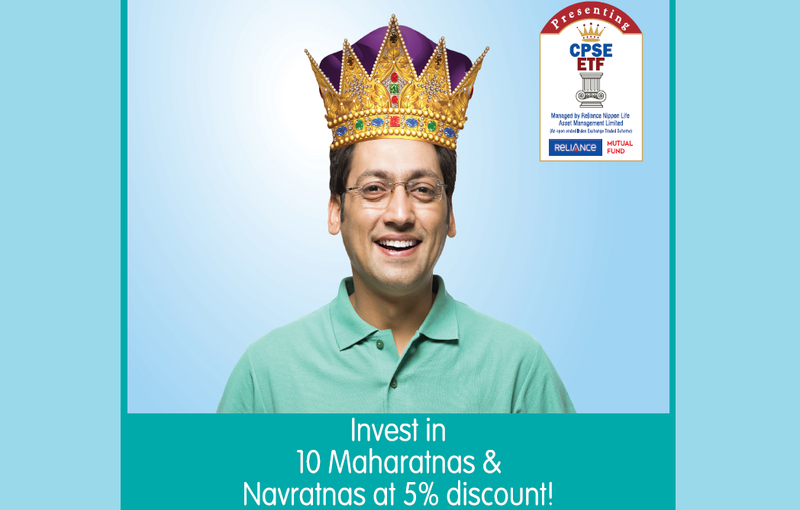 First time equity investors can claim tax savings of up to Rs 50,000 by investing in the Reliance CPSE ETF FFO. All the companies are currently trading below their 52 week high / low. The 5% discount will make these stocks even more attractive. All the companies are Maharatna or Navratna Public Sector Companies and leaders in their respective industry sectors. Why are these PSUs compelling investment choices? There is a perception in some quarters that, PSUs do not make money. It is wrong; all these companies in the portfolio of CPSE ETF are profit making companies. Earnings growth in the Oil and Gas sector has improved in what can be described as difficult circumstances for the Oil and Gas sector over the past 2 years. In fact, these companies have a strong dividend paying track record. The 10 portfolio companies paid a combined dividend of Rs 34,000 crores in FY 2015 – 2016. The dividend yield of these companies is more than 4%. High dividend yield stocks can help investors ride out volatility and can be excellent long term investment choices in a low interest rate regime. The Prime Minister has a great track record of extracting strong performance from PSUs even when he was the Chief Minister of his state Gujarat. Economic reforms measures undertaken by the Government, e.g. fuel price deregulation, banking reforms, power sector reforms etc, are likely to benefit the companies in the CPSE ETF portfolio. Large amounts of public money are invested in these companies, which are the leaders in their respective industry sectors. These public sector enterprises are critical elements of the India Growth Story. The economic growth potential of these companies led by able management and favourable government policies are likely to benefit the shareholders in the long term. The CPSE ETF has given around 12% returns since inception. The chart below shows the NAV movement of CPSE ETF. The chart below shows the 1 year rolling returns performance of the fund since inception. You can see that after giving very strong rolling returns after the NFO, the CPSE ETF languished for a period of time in 2015 / 2016. Over the last one year or so, the ETF has given very strong returns. The performance of the CPSE ETF is tied to the performance of the core sector of our economy. The situation over the past 12 – 24 months has been difficult, but if we believe in the long term India Growth story, the future is very bright. The discount on the market price makes this investment an even more attractive proposition. Though the portfolio stocks of CPSE ETF are high dividend yield stocks, the CPSE ETF did not pay out dividends. You should understand the difference between stock dividends and fund dividends. High dividend yield stocks imply that these companies are fundamentally strong and this should inspire confidence in investors. At the same time, investors should realize that, a portfolio of just 10 stocks is not sufficiently diversified, especially, if they have the same promoter, e.g. the Government of India. The stock prices in the ETF portfolio, and consequently the NAV, will therefore, be subject to a fair amount of volatility. Investors should have appetite for volatility and a long investment horizon in this ETF FFO. The growth potential of these stocks, tied to the India Growth Story, however, should have considerable appeal for investors. One should have a sufficiently long investment horizon, when investing in the CPSE ETF. Investors should consider the CPSE ETF FFO as a thematic investment, wherein the underlying theme is that, the portfolio companies are all owned by the Government of India. The discount to the market price makes it attractive for investors. Units will be allotted at Rs 10 per unit and on allotment the value of each unit will be approximately 1/100th of the Nifty CPSE Index. The minimum investment in the FFO is Rs 5,000 and in multiples of Rs 1 thereafter. The FFO closes on January 20, 2017. The fund manager of the scheme will be Payal Wadhwa Kaipunjal. While there is no exit load, given the underlying investment factors, investors should have a long investment horizon (3 to 5 years at least), when investing in the CPSE ETF FFO. Reliance CPSE ETF FFO is a great investment opportunity to buy shares of strong PSU companies at a discount to the market price. The long term growth potential of India makes the PSUs great investment opportunities in the current environment; the discount is a deal sweetener. Investors should consult with their financial advisor if the CPSE ETF FFO is a suitable investment opportunity for their investment portfolios.